An interview with GRLMIC on their first benefit compilation. GRLMIC's mission statement is plain and simple: to empower young women and non-binary youth through music. It's a sentiment that The Le Sigh values and supports wholeheartedly, so we were thrilled when we learned that the organization was releasing a benefit compilation featuring Sad13, Lisa Prank, Snail Mail, T-Rextasy, amongst with other favs. Read our chat with GRLMIC and stream the new compilation below. The Le Sigh: Tell us about GRLMIC and it's goals. GRLMIC: Essentially, GRLMIC is an organization that aims to support and empower young women and non-binary youth through music. I want young people, especially those who are at all marginalized, to know they have a place front and center in the music industry. On top of that, I want to support organizations that have similar goals and are providing important services to these communities. TLS: How did the idea come about? GRLMIC: The idea for GRLMIC has been in the back of my mind for a while now; never fully formed but always lingering. I grew up making music and had a very supportive community in the all girls chorus I was in for nearly ten years. Once I started getting really into discovering new music (back in my early AOL and X'ed out hand days); I found myself the most inspired seeing other women performing and thinking "hey, I could actually do this too." This idea for GRLMIC existed but then felt like a necessity given our current political climate. The benefit compilation seemed to be the perfect fit to launch and after the women's march I really couldn't sit still on it any longer. TLS: What are you most excited about with this project? GRLMIC: I'm most excited about all the possibilities that lie ahead and the amazing community involved. It's been such a supportive and collaborative process between me and the artists included in the first comp; having so many talented folks take so quickly to the idea and learning from them how we can make this project the most inclusive narrative. Also, being able to help raise money for Planned Parenthood and Willie Mae Rock Camp for Girls to keep doing their thing is very important to me. TLS: You've got an awesome show lined up for the album release. What are your plans for the organization after that? 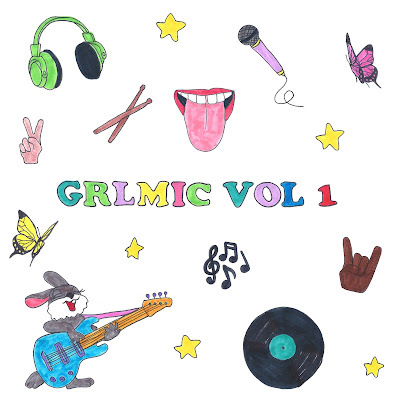 GRLMIC: A Vol 2 is already in the works! In addition, putting together some all ages music workshops. Getting more voices on board to help take this even further is the biggest next step. There's nothing I want more than to have someone who feels connected to this and wants to join and create. TLS: What were the artists' responses when you asked them to participate? GRLMIC: It was a very special feeling to have such positive responses when I reached out to the artists involved on this comp. It was fun to see the wheels in motion and how so many people already had somewhat of an idea regarding a cover they've always wanted to do. All of these covers are of iconic ladies who inspired them in music, so seeing the choices was exciting. Also, just having all the artists be so willing to pitch in with the project in any way or provide feedback was incredibly helpful. TLS: Do you have a favorite song on the album? GRLMIC: They're all so good! I'm a huge Liz Phair fan, so when Julia choose "In Love With Yourself" I low key freaked out about that one. Also there's something so sentimental about Lindsey Snail Mail)'s Sharon Van Etten cover. I could really go on...everyone did such an amazing job! TLS: Anything else you want to let the readers of The Le Sigh know about GRLMIC? GRLMIC: For anyone in NYC: the benefit show is this Sunday, April 23, Baby's All Right 6pm – all proceeds also going to Willie Mae and Planned Parenthood. Would love for people to buy the comp or even donate directly to either charity, keep making art and continue to support underrepresented voices. Album artwork by Grace Miceli. Check out GRLMIC on their website.